My husband, Ron, works a variety of shifts but the only one that he really dislikes is the midnight shift, the 11:00 to 7:30 time slot where men are made to be owls and switch to being nocturnal creatures for one week. Some people thrive on this arrangement, but Ron does not, so on Friday mornings after the last shift on that stretch, we celebrate by going out for breakfast, before he goes off to bed for the day. We have a semi regular place that we like to eat, but being a food writer now and feeling responsible for keeping Barrie informed about good eats in B-town, I said "Can we go to Fran's this time?" The sleepy, hungry millwright did not disagree. I've been to Fran's before. It's very conveniently located for us actually, with their 407 Bayfield St. location pretty much backing onto the far end of the street we live on. Most of the time, I meet up with a few girlfriends and former co-workers to catch up on the latest gossip and talk about our kids. There is always room for us and we're never rushed out. Strangely, the first visit we ever had to Fran's, a number of years ago, we had an odd experience. I must have been wearing my cloak of invisibility that day because the hostess, upon greeting Ron and I at the door, asked "Table for one?" and later when we got coffee, only Ron got refills and more creamers! I'm sure that server, and her poor peripheral vision have gone elsewhere since then. We were greeted today by a very nice young hostess who seemed to know we would want a booth, but maybe everybody wants a booth? Our server, a chipper, fit looking woman of about my age (which I'm not telling, by the way) was table side in a flash. "Can I get you coffee or orange juice?" she asked. Feeling nearly as groggy as my night owl husband today, I accepted the offer of both. The two of us would have accepted caffeinated mud I believe, but we were happily surprised by some really pleasant coffee at Fran's. The orange juice was another unexpected treat. I was unaware that Fran's was famous for it's fresh juice bar and that my o.j. was 100% freshly squeezed. Cool! Ron had his usual - bacon, 2 eggs over easy, whole wheat toast and home fries. Sure he's in a rut, but I decided a while ago that it's not such a bad thing when you're doing 'food research' as it creates a nice base line to which other similar breakfast meals can be compared. I had forgotten that Fran's had a nice selection of vegetarian items. When I come in closer to lunch time with the girls, I always have their vegetarian garden burger. It comes with sauteed mushrooms and has inspired me to add them to all my home cooked veggie burgers now. Fran's is the only place I've so far found vegetarian sausage and eggs on the menu and I really enjoy having that choice there. Our meals were perfection, what else can I say? Ron has this theory, which you may have heard me quote before "How can you screw up breakfast?" Oh, you'd be surprised! But Fran's did not disappoint. Over easy eggs are probably the #1 most likely to be 'screwed up' breakfast item, but Ron's eggs were a work of art. High fives to the cooks in the back. We were admiring the brick work on the wall by our table when I took a closer look at the wall art above us. It was a framed poster of their famed 20 College St. location in Toronto. Another thing I had not realised is that Fran's grew from a small mom and pop operation, not from the minds of a group of CEOs in a think tank who just dreamed up a chain one day. I like that. There's something nice about the idea of a little corner restaurant that simply served good food and grew organically over the years. And did you know that Fran is a guy? 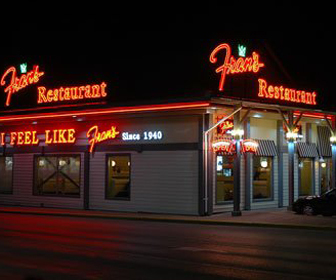 Yes it's true, Fran's was started by Buffalo born Francis Deck and his wife over 70 years ago. They claim to be the first to offer the now widespread banquet burger. Give Fran's a try, if you haven't already. Nice atmosphere, convenient location with tons of parking, friendly service, good food. You can't ask for more than that.